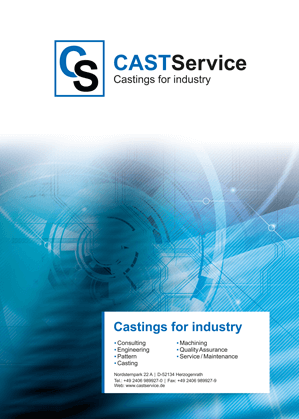 In 2006 CastService GmbH was founded as a consultant for stainless and heat-resistent special steels, cast-iron and ductile graphite iron as well as low alloyed steel castings. The companie’s varity of sources is based on individual manufacturers, each concentrating on their specific production processes, various applications and industrial branches. The main target markets are the Cement Industry, heat-treatment Industry, steel mill Industry, combustion plants as well as the common mechanical engineering. The fundamental values of our company’s philosophy consists of our product quality and delivery performance as well as the development of our customer services. In order to guarantee and continuously improve these values, it is a necessity for us to work with a functional quality assurance system. The CastService GmbH is certified by DIN EN ISO 9001:2015 and will advance further innovations to enthuse the customers.